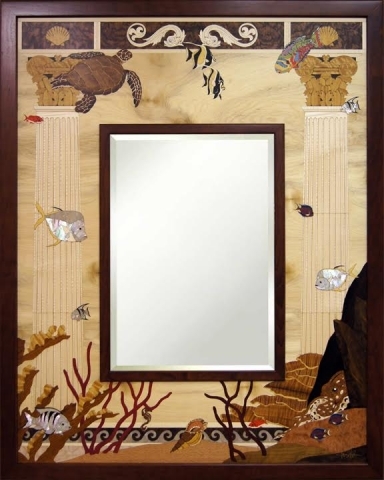 HRI - 1072 - Aquatic Kingdom Artscape Mirror by Jeff Nelson - Frame size is 32" x 40" and the glass size is 14"x20", 956 piece inlay utilizing 27 species of select Hardwood, Mother of Pearl, Abalone, Malachite and Chrysocolla veneers. This is truly a beautiful work of art that's destined to be an heirloom. 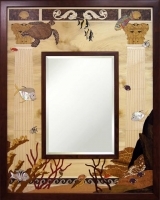 Most items are in stock and will normally ship within 24 hours. Any item not in stock will typically ship in 4 to 6 weeks.